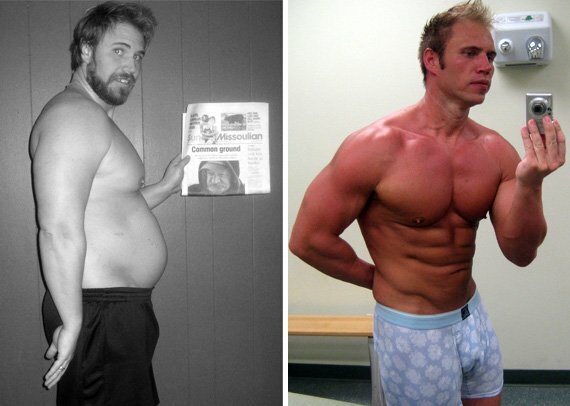 Body Transformation: Jeremiah Peterson Wins 2012 BSN Hyper Shred Challenge! Being the fat, out-of-shape dad wasn't appealing to Jeremiah. This Montana outdoorsman wanted something better for his family. His friend pointed out the Hyper Shred Challenge and it was on! I'm a stay-at-home dad with an amazing wife and three wonderful children, and I consider myself fortunate to be able to bring up my children where I was raised by my parents, in Missoula, Montana. instill in my own children. Rule 1: Be an obedient servant to God. Rule 2: Always be loyal to your family. YMCA. After graduating from high school, I went on to play college football. Playing football and working out seemed like the perfect life for me; I felt like I was living a true success story. But it wasn't until I married my beautiful wife in 2008 and started a family of my own that I truly knew happiness and success. While I may not be a millionaire or anyone famous, I feel I am the luckiest man on earth. Jeremiah: I was a few months shy of turning 34, my oldest son was about to turn four, and I realized I was in the worst shape of my life. I thought about my son going to school in less than a year, and me being the fat and out-of-shape dad. It didn't sit well with me. It was amazing that in just four years I had married the love of my life, had three kids, and packed on all that weight. I was weighing in at 280 pounds, 28 percent body fat, and I knew it was time to do something about it. With that awareness, I began to watch what I ate, started working out regularly, and lost 20 pounds. That is when my longtime best friend and workout buddy, urged me to check out this body competition on Bodybuilding.com. I knew it was time to get back into shape, not just for me but for my family as well. So, weighing in at 259 pounds and 23 percent body fat, I joined the BSN Hyper Shred Challenge on February 2012 to transform my life. I wasn't surprised by the extent of my transformation. I had committed to a change, and I knew that everything was going to be different because of that. Opportunity for change is really the only constant of life. When opportunity presented itself to me, the timing was right: mind, body, and soul completely present. There are definitely moments where you get tired. Sometimes you do have to stop and listen to your body, but most of the time it is best to just keep pushing through. It is by breaking free from your own comfort zone that you truly begin to see transformation both physically and mentally. Give up, no. I knew these 12 weeks were going to change my life forever. I was already feeling so amazing by eating a clean diet and beginning each day with an accomplishment. By using Bodybuilding.com for daily motivation, accountability and supplement resources, I found an amazing outlet. Charged on a mission, I changed all aspects of my day-to-day life for the better. Having Bodybuilding.com to keep my journal and keep track of my progress and goals helped tremendously. It was also very motivational to have the body group system of people who were going through the same 12-week journey checking out their physiques for inspiration. I think the hardest part for me was being on such a clean diet while doing all the cooking for the family. Not that we eat junk food, but it is a temptation for sure when you are with your family having fun and trying to adhere to a clean diet. But I knew that when I started this journey to get into shape it was going to take a lot of work, a lot of changes, and a lot of motivation. Get your family involved. Make going to the gym a family thing. Show your kids what eating healthy is all about. Most importantly, allow yourself a cheat meal once in a while. It is something to look forward to throughout the week. I know people have heard, "If I can do it anyone can." But it's true. I am no Arnold Schwarzenegger or Sylvester Stallone. I'm a husband and stay-at-home dad to three kids, and I go to the gym when I can. I know it can be hard to make the time, but once you have, your life will never be the same again. You will have more time and energy to spend on what's most important in life. I am going to stay strong and keep striving for a healthy balance in life. I would love to be involved in the fitness industry in some way. I mean, who wouldn't? I feel like I would be able to reach out to dads and motivate them to live a healthy lifestyle with their family. One thing I know is that I have added health and years to my life, transformed myself, and gotten my life back. I am now proud of whom I am and will be there for my family, and they too can be proud of whom I've become. I feel like God has blessed me and my family in so many ways and I will always be grateful. With the help of Bodybuilding.com, Steve Cook's cutting program, and what I knew of my own body, I found a nutrition plan that worked for me. We are all different and have different needs. It's important to factor that into the equation. For me, eating a balanced diet of lean protein, complex carbohydrates, veggies, healthy fats, and staying away from fast foods and sugary sweets were the keys to my success. I am a big-time carnivore by nature, so eating lean meats was easy for me, but I also made sure to get the right amount of complex carbohydrates and healthy vegetables. I had to eat every three hours, no question. My body was telling me when I needed protein or needed to feed my brain with complex carbohydrates. If my body fat wasn't dropping, I would eat fewer carbohydrates and add more healthy fats. A sculpted physique is won 100 percent in the kitchen. For me, working out is where I get centered and grounded. Early in the morning, while my wife and kids were still sleeping, I would go hit the gym. My overall gym experience was to work out with varied weights and body-specific targets I found with the help of Bodybuilding.com and a 6-day workout schedule in Steve Cook's Cutting Program. If I felt my body fat burning was at a standstill, I would return that night after my wife got home from work for a low-heart-rate cardio session. My overall gym experience was intense but completely doable. Personally, I am strongest in the morning, so I try to do all my workouts before my wife goes to work. Before doing the BSN Hyper Shred Transformation Challenge, I knew nothing about supplements. I never had a protein shake before! I still have a lot to learn, but Bodybuilding.com and BSN have helped me learn a lot about supplementation. Once I started the transformation, I started taking the suggested weight loss stack from BSN and had amazing results. The supplements sent my metabolism into high gear and I started to burn body fat and build lean muscle mass like crazy. All I have to say is the BSN supplement stack has turned me into a supplement believer from now on. Thank you, BSN and Bodybuilding.com. Optimum Opti-Men: I take this in the morning before my workout to get the right vitamins, minerals, and other essential nutrients the body needs. Optimum Fish Oil: I take fish oil three times per day with a meal for overall health support for heart and healthy joints. Optimum HMB: I take HMB three times per day with a meal to support the growth of lean muscle mass. Optimum CLA: I take CLA three times per day with a meal to support healthy body composition. BSN Syntha-6: To satisfy all my protein requirements, I use Syntha-6 for pre-workout, post-workout, or whenever I feel like my body may need some extra protein throughout the day. BSN AMINOx: This gives me the right nutrients to recover after training. BSN N.O.-Xplode 2.0: A pre-workout drink for muscle endurance and resistance to muscle fatigue.